Gentlemen Republic Refined Molding Hair Gel is a highly rated hair gel on Amazon. It has nearly no negative reviews, and is almost entirely 5 star reviews. Gentlemen Republic Refined Molding Hair Gel is part of one of the biggest salon quality hair product lines in America, but does that mean that it is a good product? Hopefully by the end of this review you will know Gentlemen Republic Refined Molding Hair Gel is the right product for you. Gentlemen Republic Refined Molding Hair Gel is kind of your standard, run of the mill hair gel. I couldn’t find any ingredients list anywhere online. Instantly that makes me wary of the product because I prefer to use products that are all natural. I have even gone to great lengths to make sure my products are natural by even creating my own hair care products such as shampoo and hair gel. However, the product is supposedly healthy, and it has received rave reviews. This could really be your own style of hair gel, but it isn’t mine. That is ok! Let’s look at some of the great features of this gel. Hair gel is something that you might not think about in terms of healthiness when you are buying a new tube. Admittedly, most people purchase hair gel based on effectiveness. What you might not know is that hair gel can be one of the most detrimental things you can do to your hair. It stays in your hair for a long time. It is in there possibly days. Only styling products stay in your hair that long. If they are full of damaging chemicals that can really wreck your hair. Unfortunately Gentlemen Republic Refined Molding Hair Gel is full of different chemicals. In fact, it seems to be primarily chemical and water based. I’ll cover those, but I will also talk about the good ingredients in this product as well. Actually, all that is in Gentlemen Republic Refined Molding Hair Gel’s ingredient list are chemicals and then the word “fragrance.”I can’t even know if there are really any good ingredients for my hair. Now that isn’t to say that there are a bunch of things in this hair gel, but I want my heir gel to be dual purposed. I want to style my hair while also nourishing it. One of the very few bad reviews of this hair gel is that it left the customer’s hair dry after several days of use. 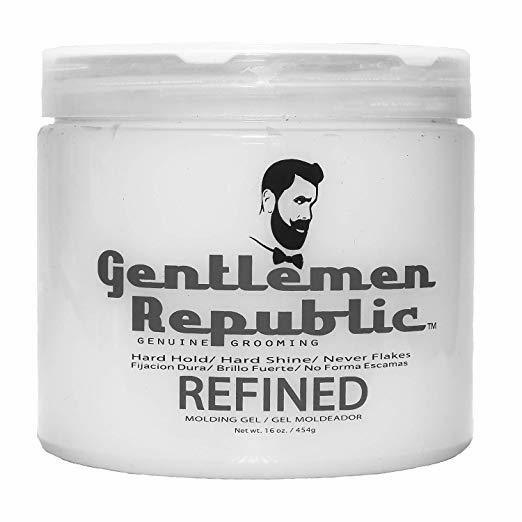 Gentlemen Republic Refined Molding Hair Gel is designed for pure effective use. Though I may have said some negative things about this product and its ingredients, one thing I can say for sure is that it works really well. Honestly this product gives your hair more hold and options than almost any other hair gel. Almost every person who uses this product loves it. This product holds your hair for a really long time and it doesn’t end up flaking off like many different hair gel options out there. Gentlemen Republic Refined Molding Hair Gel also boasts a large amount of flexibility for your hair while still holding it in place really well. Most of the negative reviews about this product are just a personal preference. Some people just don’t like hair gel and prefer matte pomade or something like that. Another complaint is that some people happened to get a used product. I thought that was really weird. The product came unsealed and one person said they even found hair in their hair gel. This company is extremely active in their online profiles and are often giving out offers and deals on their online. This company focuses on their image. Every picture gives off a message of excellence and it is clear that they care about their products. They believe that their products are second to non and that they are of the highest quality. Reviews on Amazon back up this claim pretty well. They make all types of hair care products that range from beard oils and razors to shampoo and matte pomades. Gentlemen Republic Refined Molding Hair Gel is one of the best reviewed hair gels on Amazon. It is extremely cost effective for salon quality gel. This hair gel doesn’t take much to style your hair so the container lasts longer than you would expect. It leaves your hair feeling a little more flexible, which is nice so that you don’t break your hair. This gel lasts a long time and doesn’t flake off. Some of the worst things people have found about this product are that can make your hair dry as it is mostly chemical based. Make sure you wash it out. Some people claim it feels too sticky. However, the biggest complaint by far is that the shipping is just bad. Products have come broken and unsealed. One was even a used product. Using hair gel isn’t something that everyone does, but if you do, often times the not so picky consumers will just use what their hairdresser tells them is good. There is a good chance that this could be that product. There isn’t anything wrong with that if that is what you are comfortable doing. Just know that there are other, natural options that will undoubtedly be healthier for your hair and will leave it feeling softer and looking shinier. Gentlemen Republic Refined Molding Hair Gell is a great product that you will probably like.Regarldess of being mostly chemical based, it does its job better than almost any other gel. It comes in a massive quantity so it will last you a really long time. Many of the people who use this product are longtime customer who say they will definitely be returning. They continually buy this product because it performs well. Give it a try, and you might find that you like it more than your current product. Here are some top questions that I found for people seriously considering buying the Gentlemen Republic Refined Molding Hair Gel. How many ounces is it? It is variable. You can buy it up to a 32oz bottle, which will last you a long time.